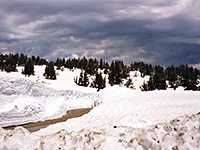 The southwest entrance to Lassen Volcanic National Park, at 6,600 feet elevation, used to be a center for winter ski activities until all facilities were removed in the 1990s, in keeping with new management policies. The old chalet building was replaced in 2008 by a brand new, eco-friendly visitor center named Kohm Yah-mah-nee after the original Indian phrase for Lassen Peak. The Southwest walk-in campsite is located in the adjacent woodland - one of five campgrounds along the main road, this has 21 sites and is for tents only. 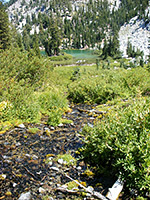 From here a pleasant trail leads through forest and across meadows to Mill Creek Falls, the highest waterfall in the park; the only other path nearby is the strenuous, 2,600 foot climb to the summit of Brokeoff Mountain, part of Lassen's former volcano. After the park entrance, main road CA 89 climbs steadily, traversing steeply-sloping terrain towards the Sulphur Works, one of the main geothermal areas in the park, and the only one adjacent to the road. Features include a fierce-sounding steam vent at one side of the highway, and various hot pools, bubbling gray mudpots, fumaroles and small hissing fountains at the other. The soil around the pools and vents has been stained by sulphurous chemicals into many colorful shades of yellow, orange and brown. Raised wooden walkways once allowed for close viewing of the features in safety, though they have all recently been removed owing to increased thermal activity, which has resulted in small new vents opening in various places along the paths, and one right next to the highway. The subterranean energy is enough to significantly warm the waters of West Sulphur Creek that flows through the area, which is an example of a solfatara - a former volcanic region now not fully active. 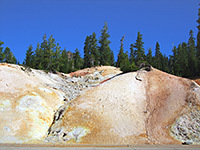 It is believed that the Sulphur Works mark the location of the main vent of the former volcano Mount Tehama. The parking area for the thermal area is also used for the short but steep Ridge Lakes Trail. After the Sulphur Works, the road twists and turns while climbing another 1,000 feet and passes two large tranquil pools (Emerald Lake and Lake Helen), this latter named in recognition of the first white woman to ascend nearby Lassen Peak. Below the road, the land slopes down steeply to Little Hot Springs Valley, an area of numerous small, scattered hot vents, though none are close to any trail. One mile east is the largest thermal region, and the last close to the highway - Bumpass Hell Basin may be reached by an easy 1.5 mile trail and is definitely one of the highlights of any visit to Lassen. The only other hot springs and pools in the park are found at Warner Valley, 5 miles southeast. 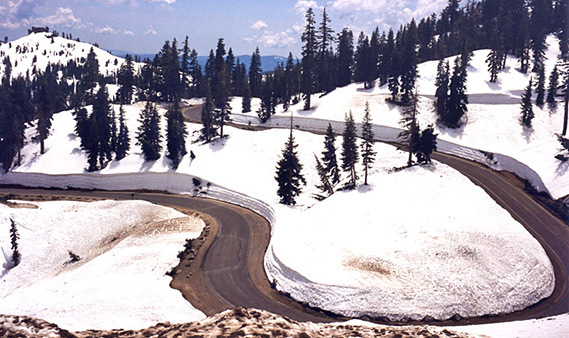 The scenic drive reaches a high point of 8,512 feet (2,650 meters) near Lassen Peak, the tallest mountain in the area, and one snow-covered all year apart from a few months in summer, when the 2.5 mile trail to the summit is one of the most popular in the park. After here the road begins a steady descent across forested land, past one trailhead (for Terrace Lake, Shadow Lake and Cliff Lake) and into the valley of Kings Creek. A spur road reaches a quiet, secluded picnic area right beside the creek, which is surrounded by short grass meadows, filled with wildflowers in summer. 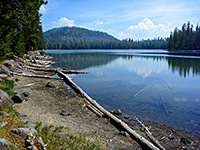 A trail leaves here to various destinations including scenic Crumbaugh Lake, the carbon dioxide-infused Cold Boiling Lake, and Bumpass Hell - a longer, steeper but much less busy route than the main trail further west. The highway continues to descend through forested terrain, while still providing many precipitous views into valleys below. 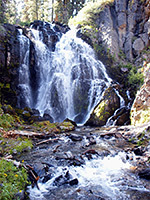 Another popular trail along this section is to Kings Creek Falls, a powerful 40 foot cascade in a narrow, wooded canyon. There are two more campgrounds either side of Summit Lake, a rather nondescript pool in the middle of thick forest half way along the drive, together with trailheads for two longer trails (Cluster Lakes and Corral Meadow) leading into the roadless country to the east - most of this area is a large, forested volcanic plateau sprinkled with cinder cones, lava beds, lakes and meadows. The Pacific Crest Trail also crosses this region, and continues towards more extensive areas of lava north of the park in Hat Creek Valley. Beyond Summit Lake the land flattens out as the road curves round the north side of Lassen Peak into the Devastated Area, a section of the hillside that was ravaged by lava and landslides resulting from the 1915 eruption, and which has provided a model for the likely recovery of the countryside around Mount St. Helens in Washington state following the 1980 eruption there. A short path loops through one small section, and has interpretive notices about the different types of rock produced by the explosion. There is less of interest along the northern section of the scenic drive. Hot Rock is a large piece of lava transported a particularly long distance by the mudflows resulting from Mount Lassen's eruption, big enough to stay warm for many days afterwards, though now it is just an unremarkable boulder at the edge of the forest. More volcanic damage is evident near the north entrance station at the Chaos Jumbles, a collection of large jagged boulders that resulted from a violent air-cushioned rock slide emanating from the nearby Castle Crags volcano, 300 years ago. 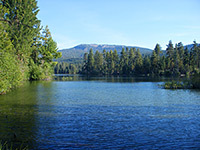 This is close to Manzanita Lake, a popular spot for fishing and boating, and the location of the largest campground in the park. In recent years, sightings of black bears have become more frequent in this area.